Plot Summary: After his mother passes away, Taro Hanaukyo is invited to his grandfather's home. There, he meets a beautiful maid named Mariel and finds out that his grandfather has retired to a remote island and has given him ownership of his estate. Taro also discovers that not only is the estate a colossal mansion, it has hundreds of gorgeous maids ready to serve him 24 hours a day, seven days a week. 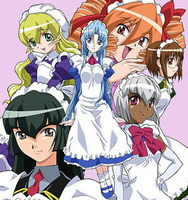 Despite using the same voice cast of the first series, Hanaukyo Maid Team: La Verite uses a completely different production staff. La Verite is French for "the truth," which denotes that this series is a more faithful adaptation of Morishige's manga than the first series. DVD Production: Geneon Entertainment Inc.